Tired of the hassle of changing out your latigo straps or off billets? Frustrated at the little straps of leather that BREAK when you are trying to change them? Cody Grey is the answer! 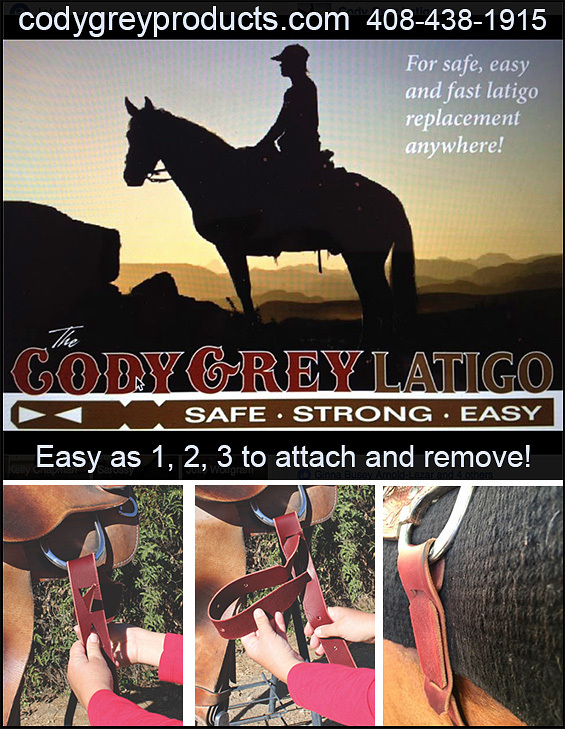 Cody Grey Products was started in 2010 by two avid horsewomen who understood the need to create a latigo strap and off billet that were both easy to change and SAFE for riders, Debbie Cote (horse lover and rider) and Leah Grey (trainer) patented the Cody Grey Latigo. This new latigo will forever change the way horse men and women think about both latigos and off billets and will revolutionize both convenience and safety for horse owners. Says Debbie… Since then, we have been riding in them daily in all kinds of weather and all kinds of conditions to make sure they can stand up to the wear and tear of a trainers and horse lovers alike. We rode in them across different disciplines, took them on and off multiple times, and even cleaned them repeatedly! We were thrilled with the outcome. No more rawhide strings, no buckles, no tools required! SAFETY is our first and most important criteria. Our PATENTED self-latching latigo has been rigorously tested and is easy to use, strong and safe. Cody Grey latigos and off billets are made of a single, high quality leather strap that is actually EASY to attach and remove. You’ll love it and we promise you’ll never want to go back to the old style latigo again! What Makes the Cody Grey Products So Different? You’ll notice immediately when you put them on! Convenience and safety are the leading factors that separate Cody Grey from ALL other latigo straps and off billets on the market today! How Much Do Cody Grey Latigos and Off Billets Cost? The real answer lies in how much they save you in time— and safety! Not little “leather strings” to break and fail while riding your horse. Horse owners will be pleased to know that there are 2 colors (burgundy and black) and that the latigo is only $36.95 with the off billet only $24.95! What Does InfoHorse Have To Say About CodyGrey? Where Can I Buy My Cody Grey Latigos and Off Billets? Don’t be surprised when tack stores and popular horse catalogs start carrying Cody Grey— and be sure to ask for it from your local dealer. Right now you can visit our website at CodyGreyProducts.com and we will help you with your order. You’ll love Cody Grey and NEVER want to go back! Remember, everything is riding on your horse— and Cody Grey makes sure your latigo and billets won’t fail on the trail— or anywhere else! Call and order today!